First and foremost, we do not breed to sell puppies. 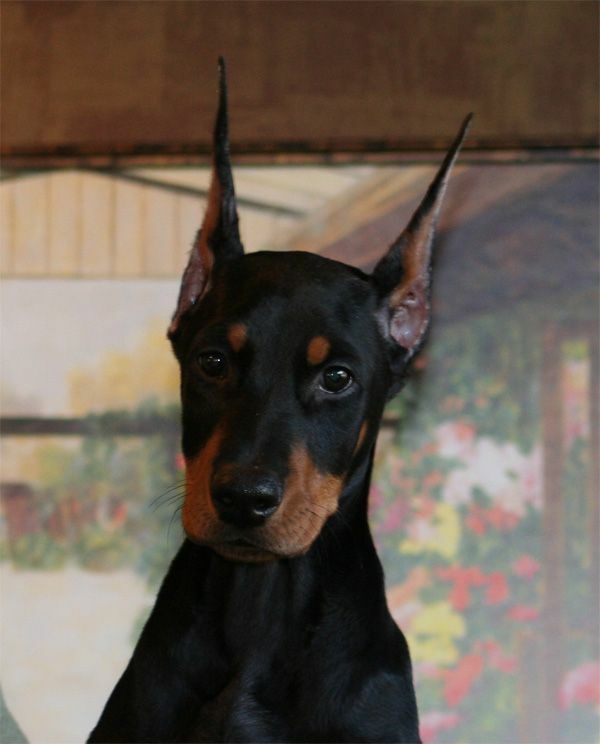 Rather, we breed to produce outstanding Dobermans, with correct temperament, structure and breed type to carry the breed forward. Do not come to us with your laundry list of what the dog will do for you. Our response will be, what is your background, what knowledge and experience do you have with the breed and the issues breeders face, and what will you do for the dog? And, what is your understanding of the limits of veterinary medical science, and specifically, the problems created by the AVMA, including over-vaccinations? We want to know that you will not harm the dog, even with your good intentions. 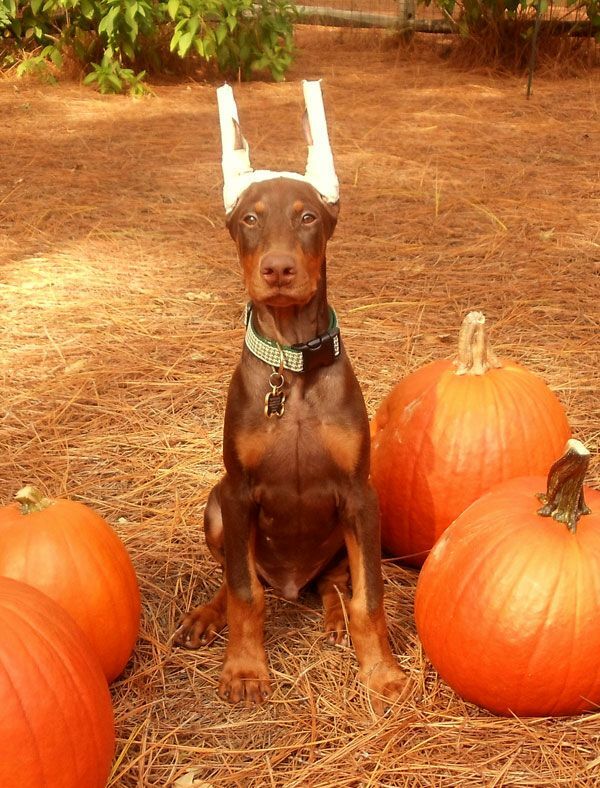 A Doberman is NOT a Golden Retriever with pointy ears. Rather, a Doberman is a guard dog, bred to protect and serve its owner. For this reason alone, a Doberman is not the breed for everyone. If you are looking to purchase a puppy and then do with it as you please, based upon something as fleeting as a “Google” education, a memory from childhood, or what you saw on Animal Planet, then keep looking. We are not the breeders for you. Unlike commercial breeders, or breeders that make a living selling puppies, we do not breed to sell puppies. Rather, we breed for us, and to produce quality that will carry the breed forward into the future. If you contact us with a laundry list of what you expect the dog to do for you, don’t hold your breath waiting for a response, because there won’t be one. If you contact us wanting the genetically perfect animal, with perfect conformation, that you intend to spay or neuter, I suggest you seek a puppy from the animal rights idiot who espouses the “Spay/ Neuter everything” agenda, because we will never place a dog with you. As a fact, in this day and age, breeders of quality are an endangered species. If you are young and fresh out of school, living in an apartment or rented home, we do not have a dog for you. If you are enlisted, we do not have a dog for you. We seek homes with stable mature adults, who are financially secure and capable of making a commitment to this amazing breed, for now and the future. We seek homes that understand how precious and endangered the well- bred, purpose-bred, pure bred dog is in this country. We seek homes that are willing and able to take the beautiful dogs we breed into the future, for generations to come. We co-own every dog we breed and are involved in the life of these dogs until the day they die. We are adamant about one specific condition, if you are ever to part with a dog we bred – FOR ANY REASON – the dog SHALL come back to us. We are very serious about this, so much so that there is a $15,000.00 (fifteen thousand dollar) fine for violating this clause of our contract. This is The Helsdon Clause of our contract. 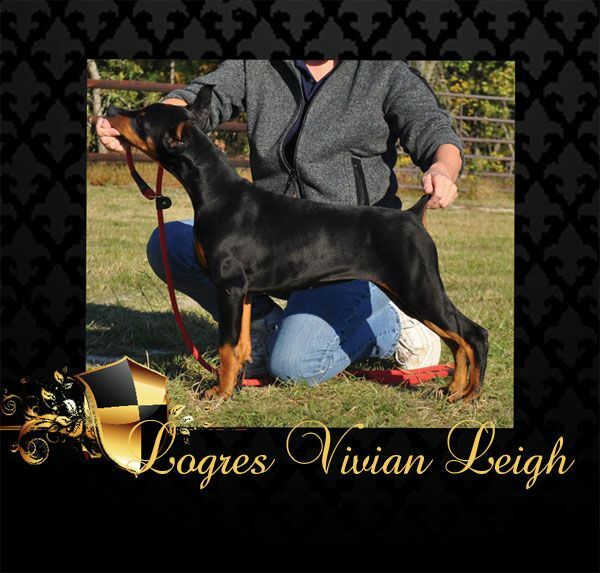 Logres is committed to breeding healthy sound Dobermans of excellent breed type, who exemplify the great attributes of this wonderful breed. 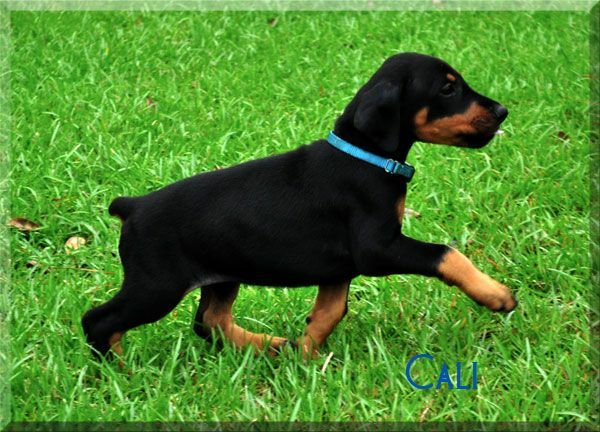 As you can see from our website, we have a specific look that we prefer, which fits within the breed standard. 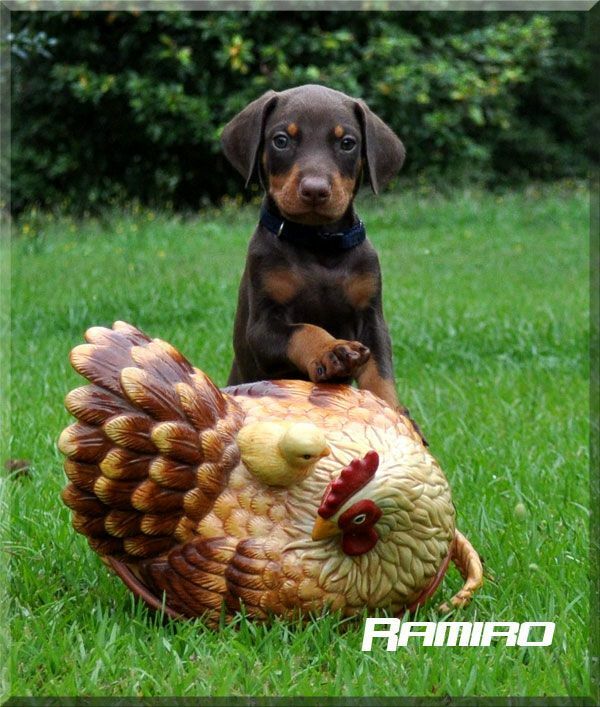 Other breeders may interpret the standard a bit differently, we believe that doing so healthy for the breed as a whole, and wish all breeders well. With respect to health testing, as most of you reading this know, there are new tests popping up every day, which open a huge can of worms for breeders, prompting constant updates to this page. Many of these so called “tests” are rushed to use before any peer reviewed published research. Over time they prove to be useless in the context of making breeding decisions. 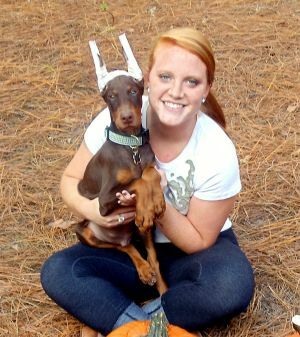 It is frustrating to hear well-intentioned individuals encouraging that, based upon a single “test” result, breeders should put a scarlet letter on a breeding animal or breeding line. These advocates ground their righteous ignorance in what they think is some “high ground” of medical science. In our opinion, they lack any true understanding of medical science, available testing, genetics and /or the limitations of veterinary medical science. Some tests have value in a breeding program, some do not. Dr. Greenwood is a physician. Unlike many breeders who lack his formal medical education, we do the tests that we feel are predictive of what a dog will transmit, based upon current published, peer-reviewed science. We then use those test results in the manner intended, i.e., they are part of the complex puzzle of a living creature. If you wish to purchase a dog from us, we will disclose all relevant testing of all dogs in our pedigree. Unfortunately, as of this date veterinary medical science simply does not offer the guarantees that the American public would like. It is simply not possible to produce a genetically perfect dog, it never has been possible, and likely never will be possible. Living creatures are simply too complex. The issue is really about making intelligent choices with the science and data we have, and not running off half-cocked, which will do great damage to our breed. It would be wonderful if building the perfect animal was as simple as people thought, but it is not possible to produce a genetically perfect living thing. Before breeding any dog we consider the whole dog, strengths and weakness, in the context of the breed standard and all other important criteria. We strive to make informed choices about health issues based upon medical science. Genetic testing offers insight, but until we know a great deal more, these tests available as of today are merely a tool, addressing a few aspects of a complex living creature. With respect to OFA (Orthopedic Foundation for Animals), evaluations of our dogs are online and listed on each dog’s page and on the old www.logresfarm.com website. In our opinion, the Orthopedic Foundations for Animals is simply a repository of evaluations of fair, good and excellent hips. If you’ve been around awhile you’ve no doubt heard stories from people who have had experience with OFA where the story where the same dog/same radiograph was “evaluated” as dysplastic and excellent when sent in at different times, etc. The OFA “evaluation” is the subjective opinion of a radiograph, not an objective evaluation of the dog and/or what he/she will transmit. While an OFA hip evaluation is a useful tool, and we OFA our dogs, we do not believe that OFA evaluations should be elevated to the status of “genetic screening.” OFA evaluations are not a guarantee of what a dog will transmit. 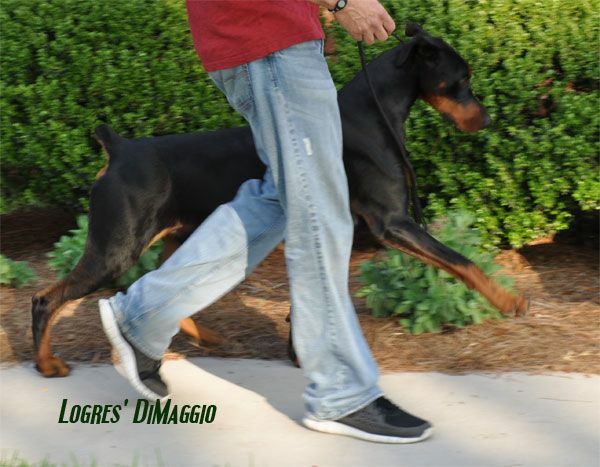 We breed very few litters and make every effort to produce happy, healthy ambassadors for the Doberman breed. When/ if health issues pop up, we replace the dog. We also try to communicate the health concern to all involved. Because of the huge responsibility we feel for each and every puppy produced that descends from our dogs, we almost never allow our dogs to be used at stud or bred. Turning people away is not intended to be an insult, nor is it a reflection on the dog or the owner, though many take it as such. It is simply a reflection of our awareness that there are limits to our time and resources and the number dogs we can realistically be responsible for. We feel a responsibility for each and every puppy that descends from our dogs and try to do our best to support our fellow breeders. 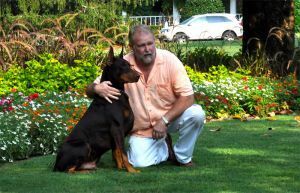 To that end, in addition to frequent updates on this website, for years we owned and supported DSNN www.DogShowNewsNetwork.com as a place for the civil informed exchange of information about the breed and dogs in general (with a searchable database). Recently we have come to feel that it is simply not possibly to have civil informed discussion, so we no longer publich DSNN (though we retained the archives). We make an effort to keep current formal and informal photos of dogs we own and breed, so that people can see the dogs as they age over time. We also work privately to support our puppy owners. I have been involved in purebred dogs for over thirty years and can not think of a breeder anywhere who has done more for their puppy owners. Though we strive to produce extraordinary quality and would like to see our puppies in the ring, we are not interested in show homes per se. As with any good breeder, we try to screen puppy buyers to assure the best possible homes for our puppies. Sometimes we have been successful in finding good homes for our puppies; sometimes we have failed utterly (and excellent dogs have been ruined by the ignorance and/or arrogance of bad owners). There is really no sure way to predict with certainty the quality of life a potential purchaser will provide. At present we look for a life pattern which demonstrates one can make a commitment and honor their word. Purchasing a dog is NOT like buying a new television… where all you have to do is pay a sum of money, open a box, plug the T.V. in and it is a “perfect working machine.” Dogs are living creatures. They require love and attention. They need our time, commitment, guidance, consistency and discipline 24/7 to thrive. They also need exercise, good food, fresh air and time to run and play. Early on, a puppy is much like a new born baby… with lots of energy, very demanding and full of needs. The puppy must come first, even before your comfort. You must provide for the puppy’s needs, even if you don’t want to, even if it means getting out of your warm bed at 3:00 a.m. to walk the dog. You must be loving, firm and consistent with the dog, even if you are exhausted and want to scream. Dobermans in particular require love, human companionship and individual attention… and they require room to gallop and play. So, if you live on a typical city lot and are obsessed with the image you are projecting to the neighborhood (i.e. you must have a H & G home with the attendant chemically treated lawn/carpet) and you value this over the health and fitness of your animals… and your dogs are therefore confined to crate, your garage and/or small exercise yard… please look elsewhere for a Doberman. 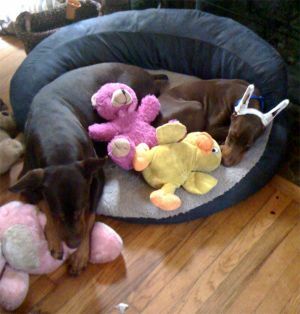 For that matter, do everyone a favor (most especially the dog) and get a stuffed toy. Everyone involved in dogs needs a mentor for guidance, someone with years and years of experience, to help you learn how to properly raise and condition a dog (whether it is a pet or a show dog). All dogs (regardless of breed and regardless of age) should be physically fit and healthy every single day of their lives, irrespective of whether they are being shown or are simply beloved pets. That means you must attend to your dog – every day – for as long as the dog lives. That is a life-time commitment of many years. It means a change in life style, and it can be a huge inconvenience if you are not accustomed to putting someone (or something) before your own needs and interests. The care and conditioning of a show dog is even more exacting and takes total discipline and commitment. Poor exercise, bad diet and the wrong training can ruin any dog, no matter how beautiful or well-bred. The Great Kafka would have been ruined in the hands of an amateur. A dog can not be ignored and abandoned to a dog-run because the owner has lost interest or does not wish to be inconvenienced by caring for the dog. A Doberman is a dog that bonds to people. It CAN NOT thrive with neglect and loneliness… it must live with its owner and share its owner’s life. If you have never owned a dog before, there is no way you can possibly understand the commitment you are making to a dog. And, once you purchase a dog, this is not something that you can just change you mind about in a month (or a year) when you have gotten bored or tired of the work and commitment required to own a dog. With respect to the Doberman, it is imperative that you have an experienced mentor, both early on to help with ear taping, grooming, training and conditioning… and later, to guide you on how to properly train and present the Doberman in the ring. No breeder wants to see a dog of their breeding presented incorrectly, or in poor weight or poor condition (with very poor muscle tone). There are more than 1001 wrong ways to train, condition and /or show a dog… and really only one way to do it right. There are no short-cuts. You will not learn the right way from a book or from a mediocre teacher/ mentor. We look for people we can trust to follow through on all aspects of the purchase agreement, which always includes the mandate that – if at any time and for any reason – the buyer desires to place the dog with a third party, the dog must come back to us. This is NOT negotiable and there is now a $15,000.00 fine on our contract for violating this provision. Overall, a breeder wants to see a pattern of proven success. The breeder’s worst nightmare is that a good puppy ends up in a home where someone – often someone new to the breed – would say, “Oh, I didn’t realize what I was getting myself into, this is too much work for me, I didn’t realize that I had to spend so much time to make the dog a great dog… I have lost interest.. I don’t want the dog anymore.” By then the puppy is ruined. The puppy will pay with it’s life for the ignorance and impulsiveness of the buyer. We intend to avoid such homes. 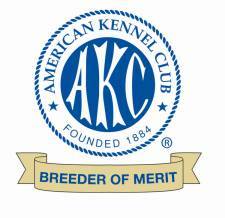 We select, not based on the size of someone’s bank account, but rather based upon their commitment to proved a healthy, loving, life-long home.As breeders and exhibitors our goal should be to go forward with the best of the best… to show the very best and to breed the very best. Nothing less than the best is acceptable (or even worth our time). And remember, every dog you own and every time you step into the ring reflects back on you. Your reputation is your greatest asset. Never, ever, ever compromise your reputation. And never present less than the best. The road to excellence is one of commitment, discipline and hard work 24/7. There are no short-cuts; success over time is not something you can buy.